Recently, my friends at Vega asked if I might be interested in sampling and reviewing their Vega One bar–a new extension of the Vega One line, which already includes Vega One shake. I said of course! The Vega vibrancy bars and the Vega Sport protein bars have gotten me through many a long day and night of post-bacc life, and I’m always excited to see what new foods the company is creating. I was gifted with all three Vega One flavors: chocolate cherry, double chocolate, and chocolate almond. Lucky me! Plus, some of Vega’s signature antioxidant, EFA rich oil blend (which I’m already a big fan of), and some of their maca chocolate, which I’ve been meaning to try! That’s a lot of nutritional bang for your buck–far more than a standard snack bar. The bars are also gluten free and soy free. Checkout the chia seeds! And did I mention they’re dipped in chocolate? Because they are. In one recent product review, a reader pointed out cost, and I replied that I’d make a point of mentioning cost in all future reviews. 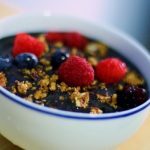 I do receive complimentary food as a blogger, but I’m also a full time (and soon-to-be perpetual) student with loans, so I’m totally committed to addressing cost along with taste and nutrition. A single bar is $3.39, a box of 12 just over $40.62. 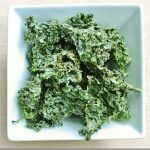 Of course, these bars provide a significant amount of vitamins and minerals, so, depending on your nutrient needs, you may be able to use them in place of a multi, which makes the value much greater. Definitely chat with your health care provider about whether the bars are a suitable choice for you as a supplement. 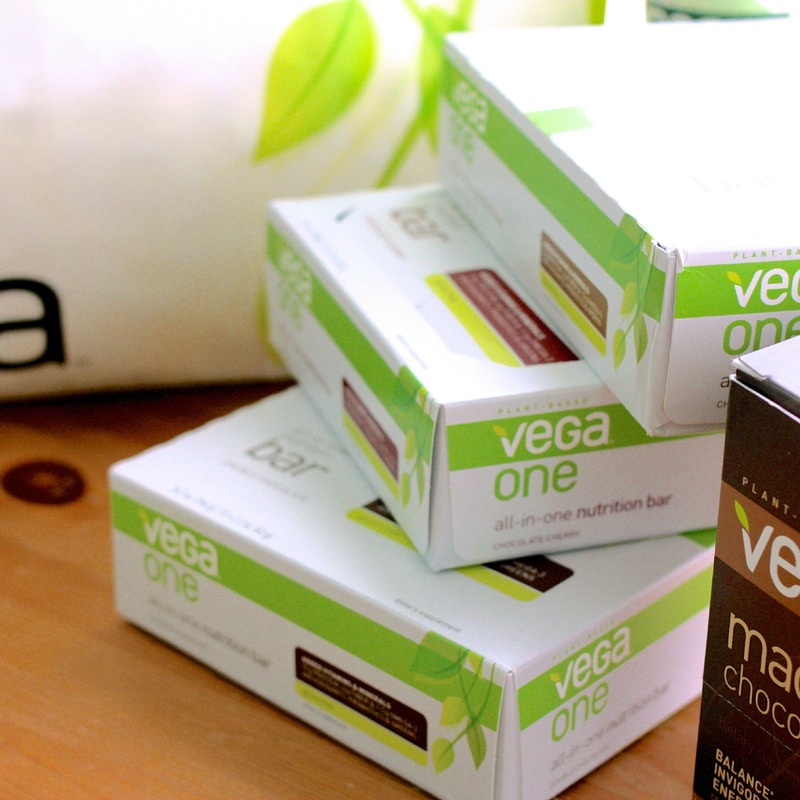 You can purchase Vega One bars at Whole Foods and health food stores everywhere, as well as online at the Vega eStore. Check them out today! My favorite flavor is the chocolate almond, but the chocolate cherry–both sweet and tart–was a runner up. 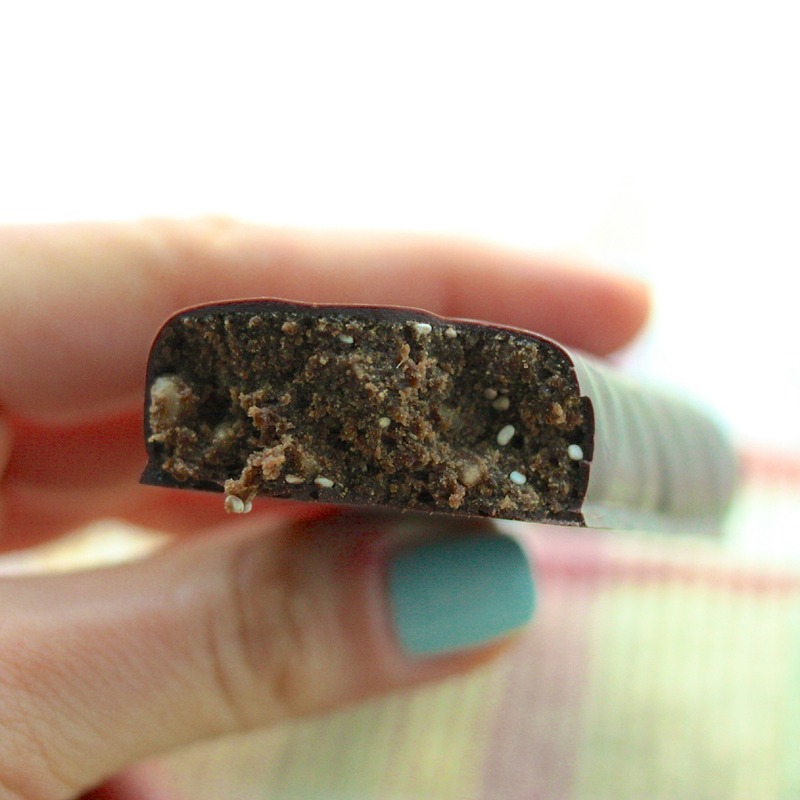 And, if snack bars aren’t in your budget, fear not. You can check out my low maintenance, easy to customize vegan granola bars at Food52 instead! Speaking of Vega–and by extension its creator, Brendan Brazier–I’ll be seeing B, as well as a ton of other vegan friends, this weekend at the Seed. If you happen to be there, say hi! Those are some seriously impressive nutritional stats for a bar. Sometimes it’s hard to find vegan bars with adequate protein. Actually, I find that most vegan bars aren’t even “protein” bars at all. They’re just bars. Delicious, but not as power-packing. I’m going to keep my eyes out for these! I practically live at Whole Foods, so that shouldn’t be hard. I love Vega with all my heart, and buy most of their products. The bars taste amazing…but I just can’t afford to buy them at $40/box. You can find these for $34.99 at Vutacost.com. Only $5 cheaper, but just sayin! Hurray!!! A vega product without stevia!!! I know I’m not alone in not liking stevia’s weird aftertaste, especially in Vega products. Many people just tolerate it because the rest of the product is healthy. Plus after such a huge investment you feel obligated to finish it! I’m not the only one who hates stevia, rejoice! I will check these out, despite the hefty price tag. hate stevia? you should hate any sugars since its spiking your insulin level thus creating inflammation in the body. I can testify that these are delicious,but I think they’re actually $4 a piece here so I have only bought a few in desperate “no time to eat must have protein now” situations. Any ideas on how to make a higher protein homemade bar, Gena? I LOVE Brendan Brazier, I have a total vegan hero crush on him. I recently won a tub of Vega One Nutritional Shake and it is SO good. These bars look incredible. 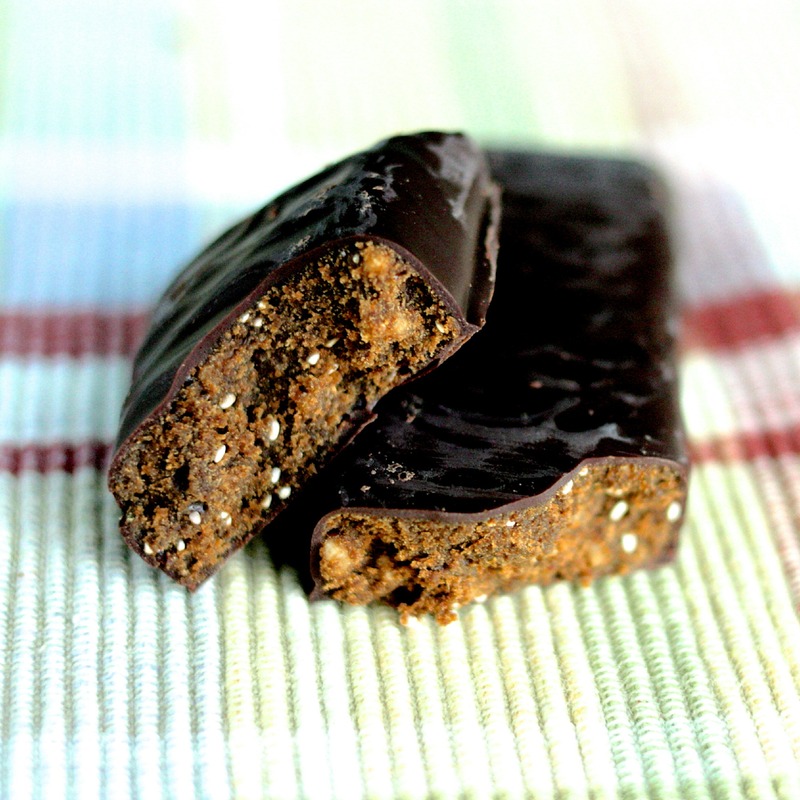 I do love the Vega line, and recently got my hands on a maca chocolate bar to try. Yum! But I do only get to enjoy them as a rare treat when I have some extra cash in my pocket. I’m so lucky to have connected with a lot of wonderful, passionate, and interesting food makers through my blog, it’s true, and I’m trying to reach out to more of them lately. I know that my access to unusual ingredients and prepared foods through reviews is a blessing, even considering that it comes in exchange for the work I do as a blogger. That said, I don’t have an unlimited budget, and my diet is much more basic now than it was when I was working full time. It’s a lot of fruits and veggies — that’s the bulk of my cost — and then beans and grains, both always from the bulk bin, and nuts and seeds, which I purchase only after some price comparison. I definitely allocate more of my budget to food than do most people, grad students or young professionals, but I make tradeoffs in areas of my budget that some people might be more generous with, too. Stay at home mom with 2 young kids here and husband active duty army and recent undergrad graduate, and I am with Gena in that our family food budget is a little higher for certain things- hemp, chia seeds, some protein powders, coconut oil, almond flour, coconut butter, ect, but we save a lot of money because we do a lot of beans, grains, and fresh vegetables which is considerably cheaper than many other family friends grocery bill. We buy a lot of second clothes and I am not big into buying shoes or bags. For us it is well worth it, we live below our means for many things so affording quality and nutritious food is our splurge. I am a mom to four kids, and we buy high quality, mostly vegan food. Lots of organic. I think many people can make tradeoffs to eat healthy food. for us the payoff is our family’s health. We don’t have big vacations, our children don’t have iPads or a big screen TV…. it works for us, and others can do what works for them! 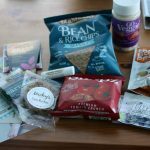 Gena, for all the unpaid work you do on the blog, you deserve some superfood freebies! 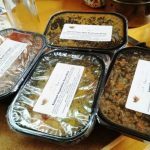 I assure you as someone who has been a vegetarian/vegan for over 35 years – and who stays away from processed food – I too prioritize my food budget so that I can purchase top quality whole, nutrient dense, often organic food from which to make my meals. My comment relates to the overall contradiction in Gena’s message: Veganism is within reach of everyone. Yet she constantly showcases uber expensive NYC dining establishments and overpriced raw/super foods manufactured by her friends and sponsors (I’m not referring to basic hemp, chia or flax seeds fundamental to a well-stocked vegan kitchen) and refers to her strict, no frills student budget – as if the rest of us who are far along in our careers are more inclined to splurge on such wasteful indulgences. In my opinion, this is an out-of-touch assumption. I do agree withKaten that my family would not even entertain going to many of the fancy veg restaurants reviewedd,mostly because we feel we make pretty great food in our own and I do not buy Vega, but other less expensive plant based protein powder. Vega is my all time favorite but the only problem is the prize!! I need to see if these are avail in the UK….they do look good but agree with other comments, am not sure if $4/£3 is a tad pricey! I bought some of Vega products already and they’re great. Those bars look amazing, but I don’t know if I want to spend $40/box. for them. So glad to hear they made the bars without soy as I’ve found that’s quite the challenge. Agree with the others – pricey but will certainly give them one try at least. Much higher protein than the lara bars I’ve bought when I’ve been hunting down bars for grab & go. I paid $2.19 for a vega bar at Whole Foods in Atlanta today. That is still above what I would normally like to pay considering my kids go thru energy bars (mainly boulder, luna and lara) like they are going out of style..but I look forward to trying it after I am finished this raw cleanse week. You do a great job Gena at balancing it all, keep it up girl! My connection timed out for some reason so if this is a double post, please delete it. These bars are quite delicious, but a bit on the pricey side! I’ve seen them for around $2.50/bar at Whole Foods near me, which isn’t too bad, but $40/box is a little much for me. I just received some for free and am on the verge of eating it but all that I can think to myself is, is this product non-GMO and I can’t seem to figure it out and I feel like I am the only one who cares because I haven’t seen anyone else ask. Does anyone know? Or care? I strongly suspect it’s non-GMO, if only because it contains VERY few GMO-prone ingredients. Also, it’s my understanding that organic foods are, ipso facto, not GMO (though I’m not 100% sure). Anonymous – the bars are organic. 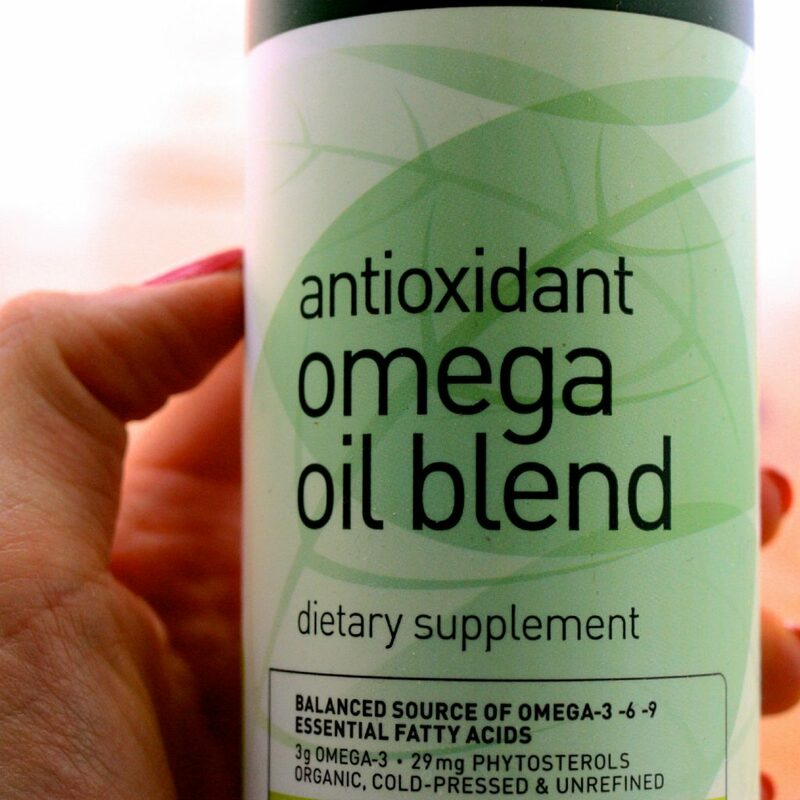 Part of the definition of organic is that all ingredients are certified non-GMO. I’ve bought these when they’re on sale and I can couple that with my 20% employee discount at Whole Foods. Otherwise, no go — except maybe in a pinch, or I’m being very defiantly bad about staying on budget. I’m not a student, it’s even worse – artist. Ha, ha… I wish there was a visible end to having no money but maybe this is my life. Whatever. I still buy about half organic, and mostly fruit/veg. I work produce so I get some free fruit thru sampling. Food is the only place I spend real money. Top priority besides art materials/studio time. It’s worth it. I’ll never subsist on ramen, don’t care how little money I have. Rather carrot sticks than that. Ok thank you for the feed back, I still do not see organic anywhere but I will take your word for it! I recieved a bunch of free bars and shakes from a local health food store that was throwing a gluten free tasting event. Health is wealth! I love Vega so much. Everything they come out with is quality whole food goodness! I’m a little disappointed. This isn’t actually a review, it’s a product profile with some additional notes about the author’s life There’s nothing I can learn here that I couldn’t learn by going to the supermarket and looking at the bar. What’s the flavor on these bars like? How’s the texture? I suppose being sent bars by sponsors does make a genuine review tricky, but this feels like thinly veiled advertising with no additional insight or perspective. Disappointing. I think you make a lot of good points here, and you’ve given me good feedback to mull over for my next review. Totally fair that there wasn’t enough about taste and texture — the stuff that one can only learn through experiencing the product. I appreciate your well reasoned criticism, and will keep it in mind! Vega is NOT organic. If you don’t see a certified organic label it is not organic. Interesting that they can spend millions on marketing and none on QA (three product recalls this year) or on providing organic products. 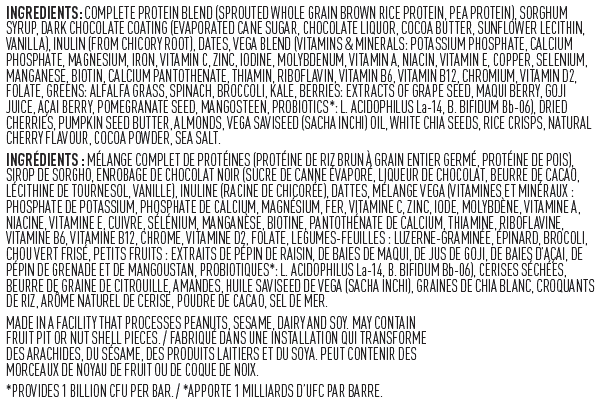 Where on the bars do you see a non GMO project verified label….it isn’t there. I saw a lot of grumbling in comments about the price of the bars, and Vega’s “elitist” pricing model. I’m a low-medium level fan of some Vega products, don’t work for them, have nothing to do with them. 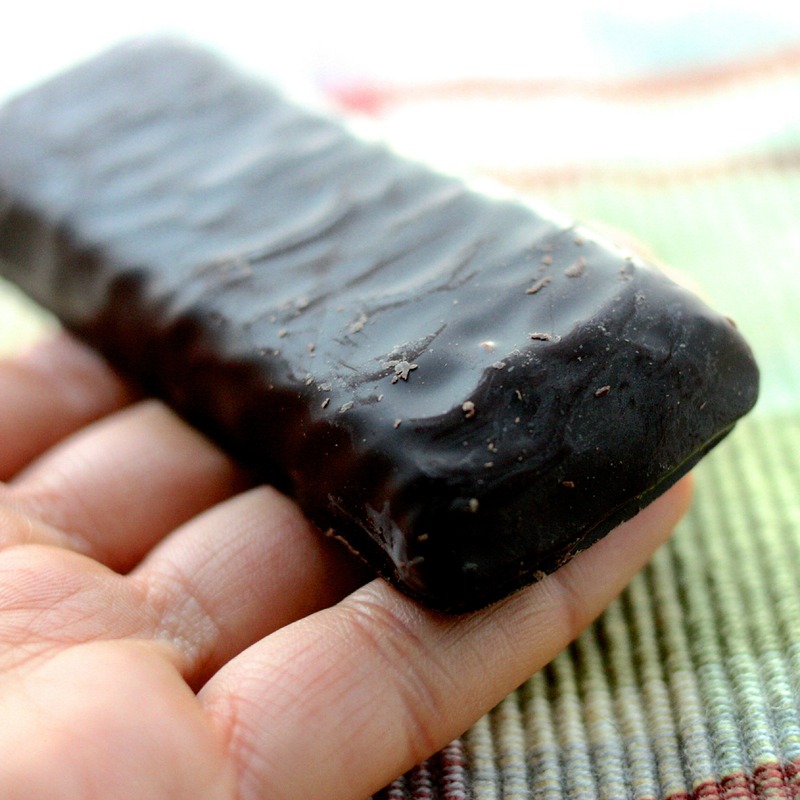 – WHY do you think the Vega bar can be made to taste good AND have 15g of protein? When you run ALL those, you’ll see why the price makes a lot more sense. They make a supreme product, and to maintain that level of taste + nutrition, it comes at a price. Is it affordable? Maybe not as a snack. But maybe as a significant part of a meal or a meal replacement… what’s your meal cost? 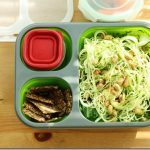 If you’re on the road, out of the house, can you eat ANYTHING with that level of nutrition for less than $4? You can’t just look at price and say “oh that’s just too expensive”, without looking at CONTEXT for WHY the price is higher (quality), AND how you’ll USE IT (what does it replace). When you do that you’ll find the price is rediculously cheap for the convenience. CONTEXT folks. Knee-jerk reactions to one variable is irresonspible of us. Put it into context and see if it still makes sense. This bar and this drink seem a delight. Does it sell here in Brazil?